A mistrial is something that neither side in a trial wants. For the plaintiff, it means the thousands of dollars spent on this trial, getting expert witnesses to Atlanta and in the courtroom and testifying for a half day or more, is all for naught and just increases the expense of the case with no resolution in sight. It also means putting the loved one of the decedent through emotional turmoil for no purpose without resolution. Likewise, it means the defendants have had to sit through a partial trial, listening to adverse testimony that can’t be all that fun to hear, but without being able yet to tell their side of the story. It is an unsettling ending without any actual resolution. It is deeply unsatisfying, disappointing and discouraging. I have once had a case end in mistrial. When you have to try the same case the second time, it’s a little bit like working out and getting your clothes sweaty, then taking a shower and putting your wet clothes back on. The mistrial in my case was because of a hung jury, not anything that occurred during the evidence portion of the trial I tend to think even the jury itself doesn’t want a mistrial. They have listened to all of this testimony and yet are deprived of the satisfaction of deciding who should win. Yet, the judge has absolute discretion when to declare a mistrial and is extremely reluctant to do so unless justice demands it. I don’t think anyone could really argue the judge was wrong to declare a mistrial in this situation. I think the judge used her discretion wisely here to say the damage can’t be undone with this jury and that justice demands a Do Over with another jury who didn’t witness what just happened. 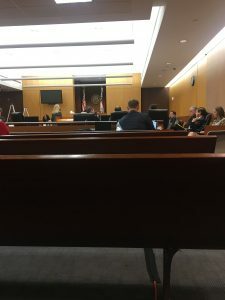 After the jury was released, the Defendant who had broken down on the stand asked the plaintiff’s attorney if he could speak to her client, who was the widow of the decedent. She said yes, and I saw the Defendant go and speak to her and then hug her. I was not close enough to hear what they were saying to each other, but I thought, in that moment, this may have been a little bit of “restorative” justice. That in some small way, this human interaction may have made both parties feel a little bit better about the situation. I believe words of forgiveness were exchanged. Perhaps some healing occurred. It didn’t resolve the litigation, but may have gone a long way toward reconciliation until the case is closed for good. They will have to meet again, in this same courtroom, with the same facts, but a different jury. That’s what justice requires. Hopefully, this connection made with the widow will help the Defendant get through the next trial, and, hopefully, will allow both to feel better about what has occurred in the past and to appreciate our system of justice a little bit more. I know I certainly do.